Wensley Roofing Ltd is working with major social housing provider Thirteen to replace and upgrade the roofing to 120 homes. 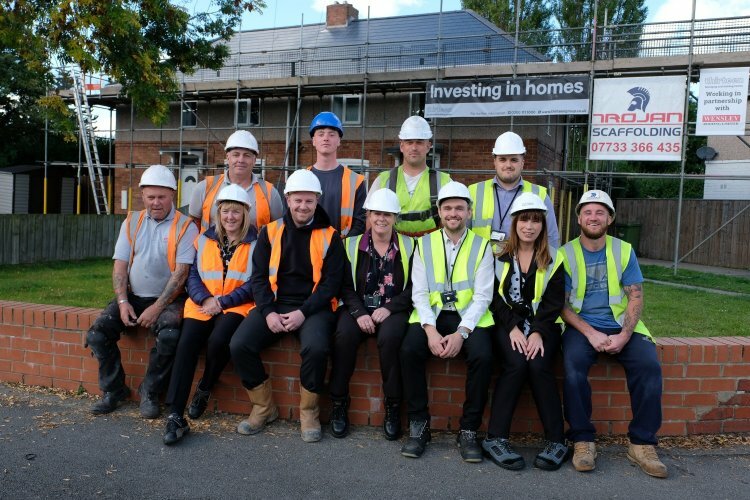 The work which started in August is on track to be completed in December, with around 40 homes already complete. The work, which is part of Thirteen’s £31m investment programme, will see the roofing replaced and chimneys re-pointed to ensure that the homes are wind and watertight and the low level vent tiles will help to improve ventilation and reduce condensation and mould. Thirteen’s project manager Stuart Poulter said: “The project has got off to a great start and we’re really pleased to be working in partnership with Wensley Roofing for the first time. The team has made excellent progress. “It’s a real team effort, as we’re working closely with our gas team to ensure that safety checks have been carried out on the flue before the boiler is turned back on for the customer at the end of each day. Managing director Steve Luke for Wensley Roofing Ltd added:” We were delighted to be awarded this contract from Thirteen, this is the first time that Wensley Roofing has worked for Thirteen, so we are all looking forward to forming a good working relationship for the future. Thirteen manages 34,000 properties from North Tyneside to York, with the majority of homes for rent and sale in Teesside. Thirteen was set up in July 2017 by a merger involving Erimus Housing, Housing Hartlepool, Tees Valley Housing, Tristar Homes and Thirteen Care and Support.